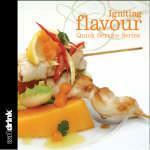 Igniting Flavour is an exclusive quick service publication from eatdrink®, featuring 12 recipes and presented in a stylish, compact and hardy format. This cookbook features 12 recipes using TABASCO® sauces and beer matching from James Squire. Be the first person to tell us what you think about Igniting Flavour and you'll save $5 on your next purchase!